Ever hear a 'man of God' say the 144,000 Jews are evangelists during the tribulation? Rest assured the only reason this personally interpreted fantasy was spawned, was to fill in all the holes that Revelation puts into their pre-tribulation 'hypothesis'. This is satan's little band-aid to explain away the multitude of verses that show brethren, saints and prophets being killed till the very end. This talk of 'on fire evangelists' saving the masses and then being martyred with all the new saints, is not only fantasy but illogical. Chiefly since these 144,000 are sealed by God himself. Therefore it would be impossible for them to be overcome by the devil, unless God removes their seal. In addition, God is no respecter of persons; so why then is it suddenly acceptable for only His 'new beloved children' ('second chancers' a false doctrine) to endure or suffer His wrath? This is silliness beyond science fiction and fails basic logic on the launch pad. Tragically, you 'have' to make it all up, to satisfy the pre-tribulation lie. Secondly, why would a demonically controlled world who has encircled Jerusalem poised to attack it and has hated Jews from the beginning of time, sit down and have a warm-hearted dialog or prayer with one? In addition, the pre-tribulation lie weavers belch forth the dogmatic 'hypothesis', that the Holy Spirit must be removed at the beginning of the tribulation. Thankfully this illogical scenario is impossible. If the Holy Spirit is removed, how is it then possible to remove four of the five fold ministries and only leave one? The fifth element, evangelist - could therefore not function without the Holy Spirit. Without the Holy Spirit, it would make the 144,000 simply carnal, impotent, over-zealous Jews. Besides, it is not the Holy Spirit that restrains evil, nor has that ever been a scriptural attribute ascribed to the Holy Spirit. It is rather the Archangel Michael that fights, restrains and finally stands up. Moreover, if the pre-tribulation lie was true; lukewarm Christians would not be 'taken' (since Jesus despises the lukewarm), they may be backslidden; yet save blasphemy, it is impossible for the Holy Spirit to ever leave them. Therefore these points destroy the hallucinogenic hypothesis, that the Holy Spirit is gone during the tribulation. The mission of the 144,000, is not to preach the gospel. The gospel message being preached during the tribulation is not any human's responsibility any longer. This is due to the abysmal fact that in over 2000 years, all of Christendom has only reached approximately half of the world's population with the gospel. The saved are no longer preaching the gospel. This is due to the fact they are in hiding and protecting their heads. Jesus told us; If they say unto you, behold He is in the secret chambers or in the desert do not go (stay in hiding). Isaiah said, Enter into thy chambers and shut thy doors, Hide thyself a little while till the indignation pass. Notwithstanding, the bride has a place prepared for her in the wilderness for 3.5 years to protect her from the beast (hiding, awaiting the Groom). No, the 'Church Age' and it's commission has passed away at that point. The tribulation gospel cannot be preached by humans, it can only be done supernaturally by the flying gospel angel in the air. There are untold millions of Holy Spirit filled evangelists living today; of which, have only reached approximately 50% of the living world so far according to some estimates, during this age of ease. So, how is it that only 144,000 are going to finish evangelizing the entire earth in less than 7 years, during the age of woe; especially with the enemies new political, religious and logistical limitations in the way? Rationalize this, how could a 144,000 so-called 'evangelists', purchase airplane tickets and gasoline to freely travel around a panicked world, without taking the mark of the beast? This single point alone, proves that the 144,000 are not evangelists. Unreal, the lies of satan are translucent once the candy shell is removed. If this evangelism 'hypothesis' sounds insane, that's good, because it is. Moreover in 2nd Thessalonians, it states that the antichrist will have all power and signs and lying wonders. he will use this power over those who received not the truth nor salvation. God would then turn on the unrighteous; and send them strong delusion, that they should believe a lie. This fact; also makes the job of the 144,000 evangelists, not only useless, but an impossible task. Why would God blind the eyes of the unsaved during the tribulation, then send out His best hand selected evangelists, into a barren field? The answer is, He would not. God would never send out a delusion that would work against God's own alleged mission; to save the lost, that can never be saved. This therefore again proves that the 144,000 are not evangelists, any assertion to the contrary is simply asinine. Here is another little sprig of illogical thought. The lie weavers say, Jesus cannot return for the rapture until the gospel is preached everywhere. Embarrassingly, this makes the job skills of 144,000 so-called 'evangelists' pretty irrelevant after a pre-trib rapture fable; since all would have heard the gospel by this point. No evangelist need apply. If you continue to follow this silly logic, it demands that the gospel only got preached to the saved then, right? If the so-called 'left behind' were only the ones that heard the message and rejected it; It would then make the job of the Flying Angel pretty irrelevant, having to preach the gospel a second time to all that rejected it the first time? Oh my, lie begets lie. Besides, Jesus did not say 'after the gospel has been preached, then the rapture would happen'. He said after it was preached, "then shall the END come"; NOT the rapture, but the beginning of a new period for humanity called the tribulation. No, Jesus returns at the very END of the tribulation period like He said; after the flying angel preaches the gospel in the air, to the very last of the soon to be crispy tares. Additionally, how in God's Holy name, could only 144,000 humans reach all 6912 multilingual speaking humans in only a few years? Gee, I guess the Holy Spirit will not only need to be present for the role of the Evangelist, but Tongues as well. "But that's it, no more! Ok, Prophecy too, fine Holy Wisdom and Knowledge also. Yeah, I suppose Ministers and Miracles as well. Now that is it, stop it, I mean it! Hey listen, I'm the 'man of God' with my TV show and new book of the week here, I think?" Preposterous ! The Holy Spirit is alive and well during the entire tribulation, all gifts blazing, ministering and comforting the wheat (saints) in the wilderness. For the people of the Most High are alive and not absent, doing great exploits by the power of the Holy Spirit. Any allegation other than this, is ignorance and or pride of the highest order. Jesus said 'there will come a day when people kill you, think they are doing God a favor'. No, the world is not willing to repent, reread Revelation. Good heavens, if all you have about the 144,000 is "they were sealed by God", this means nothing out of context. Even satan gets a seal from God, but it does not mean he is an evangelist. If these so called 'on fire evangelists' are bringing millions to Christ, where is the scriptural evidence? There is as much evidence for this, as logic (none). Perhaps these are words that have been "added" to the book of prophecy? Teachers claiming the 144,000 are evangelists, cannot resolve the sin paradox. The bible says all have sinned, even if you look on another human with lust, you have committed adultery. Yet these wild-eyed teachers claim the 144,000 are really 'on fire evangelists' that are sinless; yet somehow are allowed to violate the Word of God, that 'all have sinned'. So they have spun an endless paradox for themselves, since they are exempt from sinning as the Bible proclaims; thus to satisfy the evangelist myth, God must supernaturally intervene and preemptively remove their freewill. This amplifies the paradox, in that they are not truly human, not having to suffer temptations and failures like us; moreover they would not by definition need salvation. In this evangelist sin paradox, they are not faithful servants, but merely mindless robots. Unfortunately these truths, ruin the romance of the evangelist novel. Ask any Jewish scholar and they will tell you, that no pure bloodline exists today of any of the twelve tribes of Israel. This fact is due to the innumerable inter-marriages that have polluted the bloodlines. You cannot point to a single person from a complete intact tribe. In fact, ten are totally missing. Therefore this poses one of many very difficult problems for the lie weavers. How does the Lord mark these 144,000, if they are no longer around? "I know, their bloodline magically becomes pure again, when they find and drink 'grape juice' from the mystical goblet used at the last supper. Yeah... That's it..."
Their neatly packaged presentation, falls apart when one steps forward to the forest's edge, only to discover cardboard trees. All in the name of faithless fiction, in hopes of saving their fearful dung portals and pulp filled wallets. Instead of inventing more wild stories to cover up all the previous lies, let us look at what the Bible says about them. They are servants of all the tribes of children of Israel ("children of Israel" vs. "tribes of Israel" interesting distinction). They are standing with the Lamb on Mount Zion when He returns (Not scattered about the earth preaching to the masses). They are sealed with the seal of God. Of which has their Father's name written in their foreheads (A written name, denotes covenant, ownership or authority). They sung a new song 'in' Heaven with harp accompaniment (Not on earth, in Heaven). No 'man' could learn that song (Must be a pretty complicated song to sing for mortals, obviously it can only be sung by immortals. Secondly, by definition it is scripturally impossible for 144,000 'men' to learn it). They did this in 'front' of the Elders and the four Beasts of God (Not on earth, in Heaven). They have never been with a woman, virgin males (In my lifetime, I have known of only one male virgin. First you must define 'adultery of the heart' and the word "is", right?). They follow the Lamb everywhere (Hard to do on earth, since Jesus is still in heaven. Jesus is not walking to and fro about the face of the earth. Not on earth, in Heaven). They were (past tense) redeemed from among 'men'. They were (past tense) redeemed from among 'the earth'. (These were taken out of the earth, before the last day like the rest of us). They are the firstfruits to God and Jesus (Harvested/Raptured 'first' before any others 'us'. This attribute is impossible to satisfy in a pre-tribulation model, since we would have been 'first' according to the lie weavers). No guile found in their mouths (No deception, harsh speech, gossip, cross words or a single 'slip up' towards anyone at anytime in their life, hmmm... Sounds inhuman or messiah-like to me). They are sinless without fault (Impossible, "For all have sinned" unless they are all 144,000 messiahs; or infants killed at birth and/or before the age of accountability, which also disproves the false doctrine of 'original sin'). Before the throne of God (Not on earth, in Heaven). Here are 14 very telling traits that describe our subjects. Beloved, the above traits are clearly talking about 144,000 who are already in Heaven before the throne of God during the days of vengeance. They apparently have no need of a judgment, they are standing with and following Jesus everywhere, singing a song that is impossible for humans to learn. They were 'taken out' from among 'men', they have no deception in their mouth; they are sinless, they are male virgins and children of Israel. There were at least two times in history that Jewish baby males were killed in a post-birth abortion. Most notably, when Pharaoh instructed his people to drown all Jewish male babies, thus Moses was set adrift. The other was during the reign of Herod. Thanks to meddling wise men from the east, Herod had all Jewish male babies slain that were two years of age and under. Not only in Bethlehem, but in all the coastal areas as well. An amazing parallel with Moses the Christ figure, escaping in Egypt from a slaughter intended for him, and Jesus escaping to Egypt from a slaughter intended for Him. Herod's mind numbing tragedy has become known as the "Massacre Of Innocence". Many paintings and hymns were written to immortalize it. Since the sixth century, December 28th is kept by many Christians in various countries, as a day of remembrance and observed as such in their service called 'Childermas'. The Greek liturgy records the number to be 14,000, the Syrians record the number to be 64,000 and shockingly many medieval writers record the number being 144,000. Numbers vary greatly; however it is worth noting, it was once common understanding, that the 144,000 Jews were these actual slaughtered infants. This information has been lost. Especially in light of the devil's popular; sermons, books and movies, claiming these are 'on fire Jewish evangelists' with not a shred of scripture to show for it. If Herod's numbers did not meet the 144,000, God certainly could draw from Pharaoh's pure Jewish bloodline massacre numbers, if needs be. Beloved, these 144,000 are literally pure bloodline ancient babies. Already in Heaven, in the presence of God and the Lamb. They are full sized angels now, that are prophesied to return again. So, how can we tie all this into scripture? The Bible says they were the 'First Fruits'. These are without error, the first martyrs to die for Jesus. Stephen was the first willing martyr, but these were the first to die in place of the Lamb of God. Totally innocent, no need for judgment, male virgins, no deceit in their mouths, children of Israel. Jewish evangelists? Hardly ! Moreover, it would be a fool's errand to locate more than a handful of adult male virgins nowadays. This Jewish virgin trait also shows us: that the 144,000 are not comprised of a few decades worth of human elected, seed squirting, daily sinning gentiles from Brooklyn New York; peering out a tower with their scores of fathered children therein. There are also several haunting prophecies from the Old Testament. That state, there was bitter weeping in the land for her children that were no longer. The Lord said; do not cry, they would return again into the land. Babes would rule over them and oppress them. Those in the house of Joseph's tribe; that had been the weak spoil, would become strengthened over the strong with fire. Out of the mouth of babes and sucklings hast thou ordained strength because of thine enemies, that thou mightest still the enemy and the avenger. Jesus said, there are three groups of servants. The first group (Jews) were sent out to invite all, to the wedding. The second group (Gentiles) were told to tell all, the wedding was ready, but they were mocked and killed. The third group (144,000) were sent out to destroy those, who slew the second group and burn up the city. When Father saw His second group being killed by antichrist, He was enraged and sent out the third group. This third group will gather all the tares first into bundles and burn them. Next they were told to gather the wheat into the Lord's barn. This is the small rare remaining second group that were not overcome by the antichrist, were alive to meet Jesus at His return. The third group was sent to 'gather all' on the highways in one net, including the slaughtered sinners and saints. The living saints will be healed and transfigured in the regeneration (via a sting-less death) and given sun-bright marriage garments. 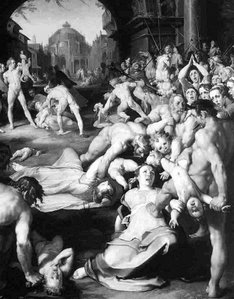 Their contemporaries; the tribulation sinners (goats) were found naked at the wedding in Heaven and cast out into the 'dark', to await the final battle 1000 years later, then final termination in the 'bright' lake of fire. It was most staggering for me to learn of the Holy Spirit, that the tribes will return before the Blessed Lamb to execute judgment on the lost and follow His verbal command to "Destroy them". Jesus repeats this in red, that before His coming, He firstly sends forth the reaping angels (144,000) to gather out all that offend (the tares). Also, to kill, then gather and burn them into piles of ashes, that the righteous walk on. This is perfectly in line with two in the field and one is taken and the other left. The Disciples asked Jesus "where Lord" (where are they taken)? This is the only place that Jesus decodes the question for us and says, they are dead and eagles food. Beloved the first one's taken are not the saints (wheat), but those that offend (the tares). Jesus said "then" (next) will the righteous shine forth as the sun when He returns. Amazingly, science says that your body, has more heat energy (per cubic meter) than the same amount of area from our Sun. Meaning once we are transfigured, we will shine as bright as the sun. Jesus' return is a two step process; The tares are taken, piled in bundles and burned which the wheat walk on. Next the wheat are harvested in the regeneration and turned into light (transfigured). To seal the concept for those that have been brain washed, Jesus again repeats the order. The 144,000 will, "sever the wicked from among the just." Once again, God's ways are contrary to the 'man of God's' fearful and demonic teachings. It is also very unusual that the number He returns with is so low, only ten thousands of His angels, especially with 6.5 billion currently living on the earth. Yet even that population will have been greatly reduced; at least by 60% for reason of the many plagues, before the last day harvest. Leaving only 2.16 billion tares and wheat. Historically we can see, as in the days of Lot, only two angels were needed to destroy Sodom and Gomorrah. Once again in 2nd Samuel; that 70,000 men can be killed by one angel. Then God repented, and made a short work of it and stopped the reaping angel's intended multiple day slaughter spree and told him that was enough. Thus it would only take 30,857 reaping angels to kill off the remaining 2.16 billion remaining living in one day. Therefore, since one can put a thousand to flight and two ten thousand; so a 144,000 is actually an outstandingly high number, based on this staggering mathematical 'J' curve. Which sustains that God will cut it off again prematurely and make a short work of it. Yes, the entire population can easily be killed within 1 hour with a mass army of 144,000. However keep in mind, that it is not only humans that the 144,000 are dealing with. They are also gathering up all the demons loosed from their chains upon the earth in that day. Therefore this number now seems more appropriate. This number of 144,000 also shows us, that it is not His bride of trillions that returns with Him to do the killing; but only a small select sealed army of ten thousands (144,000), to "pluck up by the roots" the "twice dead". Those that will experience the 2nd death. These that return before Him: can only be the 144,000, which are sealed angels, with the 'seal of God'. A seal always signifies ownership and or authority. I have never seen any seal that can provide physical armor. This seal is not a seal of protection for those 144,000 already in Heaven, but an authoritative ensign, office of power or license to kill on earth in Father's name. Since all that enter Heaven must die prior to entering, the question remains, how did these infants get there if the tribulation or the rapture has not occurred yet? Matthew's account actually addresses this. These 144,000 were the one's who were resurrected after Jesus' resurrection. First Jesus died on the cross; then after His resurrection, an earthquake took place, many graves opened, and many came out and walked around town. I suspect your pastor has not talked about this little insignificant occurrence. These were the adult sized, glorified bodies of those babies that were born and slain during Pharaoh and Herod's reign; some 1500 years prior and also some thirty-three years prior. Of which did not aimlessly walk around town talking to strangers, but some went home to comfort their mothers. These slain, are those whose bones were very dry, sinews, flesh and breath returned, after a prophesied earthquake occurred; behold His great army, each from the whole house of Israel returned to the land, living, stood upon their feet; as testimony that you would know I AM the LORD who performed this graveyard resurrection. Being that these 144,000 are the "first fruits", it completes the circle. Not only were these infants the first martyrs harvested, but the first resurrected, at the same moment with Jesus at His resurrection. Unlike the lie weavers that use the 144,000 as mythical 'Jewish Evangelists' to explain away saints being killed during the tribulation, let us look at what scripture has to tell us. This male virgin gathering slaughter trait, has been used before; since they are immune to the temptations of whores. Eunuchs gathered the great whore Jezebel, and her blood splashed upon the horse of the anointed King that trampled her; as will the blood of all flesh of Babylon, next time up to the horses bridle. Jezebel's carcass was then eaten by beasts, leaving only dung-like fragments, as it will it be again with all flesh, immediately after the tribulation. In the book of Numbers we can see that God used the exact scenario of a 12 tribe slaughter attack, on a prior occasion. Amazingly God instructed Moses to gather 1000 from each of the 12 tribes of Israel and array them for war with signaling trumpet(s) before them. God instructed them to destroy the Midianites who held the doctrine of Balaam. Not only all the living, but their cities with fire. Does this battle plan sound familiar? After all the cities were burned and all the men slaughtered, Moses was angry that the women and children were still living. He instructed them to kill all the male babies and all the women except the virgin women and girls. A stunning parallel to the parable of the 10 virgins, half fall and half marry. Jesus will come save the virgins again. His Church who did not defile herself with the enemy, a bride without spot or wrinkle, who has bathed herself in His blood. The account also tells us that they took staggering amounts of all the enemies livestock and metals. The metals gold and silver were then purified in the fire and water. They then used it in the tabernacle for a memorial to the Israelites. We also saw this plunder when the Jews left Egypt and took metals and jewels from the Egyptians. Once again after the slaughter by His angelic army. Of course, God owns all this to begin with, but it amplifies that the wealth of the wicked is laid up for the just. Scripture shows that this battle plunder will be ours again. In addition, the Bible states He will purify His church (1/3 of humanity) and try them in the fire like gold and silver. Only those who are faithful until death and those that wait patiently and overcome will make it. The 1000 member per 12 tribe attack worked so well, God plans to use it again. This time He is killing a much larger amount than the Midianites, all of humanity. Thus the larger number of warriors from each tribe. With breathless profundity 12 x 1000 = 12,000; the exact same number that Revelation says will be drawn from each tribe. Notice what Jesus' ultimate choice of punishment on humanity was; at the highest point of peril, in the garden the night off His betrayal. When Peter heroically and unashamedly pulled his sword and aimed for a swift beheading of the high priest's servant, missed, only cutting off an ear to protect his God. Jesus' most damning response to everyone present was to; call upon the Father to send 12 legions of angels to avenge Him. Jesus gave us a very interesting clue here. Matthew's account says a great multitude with swords and staves came to get him. After the servant's ear was cut off, Jesus proclaims; "Thinkest thou that I cannot now pray to my Father, and He shall presently give me more than twelve legions of angels?" A legion is defined as 3000-6000 soldiers. Since Jesus said "more than" and Yahweh is a God of abundance, let's use the higher number. 12 x 6000=72,000. Amazingly this number is exactly half of 144,000! Coincidence? I do not think so. 72,000 was far more than was needed to fight off this sword wielding multitude; but Jesus was showing them all, what power He had with the Father, 'I could bring half of God's army here if I wanted'. Moreover, it empirically shows us that angels are prepared as warriors, to kill humans. Shockingly, Jesus speaks here of yet another 12 tribe attack right in front of our noses, 2000 years ago; which has just now been revealed to us by the Mighty Holy Spirit. Jesus was reminding everyone of His prophecy He taught earlier about the Father; that He will send out reaping angels to sever all the offending tares from the just first, then gathering the wheat last. Yet with this 'seemingly simple' phrase to Peter, Jesus was also prophetically pointing to what John would soon pen in Revelation; 24 legions or 12 thousand from each tribe (144,000). Jesus was masterfully proclaiming, I could end civilization right now, today in one hour, but the scriptures must yet be fulfilled. Majesty, Glory and Honor to Yahweh for Immanuel's submission. Due to sequential perfection; I am impressed upon that the souls under the altar at the fifth seal, that were 'slain' for the word of God [Jesus], are the 144,000. They asked, "How long O Lord till our blood be avenged?" They were told, to wait a little season till their brethren be killed as they were. Amazingly as the word of God is always perfect, the sixth seal says, the sun and moon are darkened, which is exactly the sequence that Matthew, Joel and Isaiah stated would happen right BEFORE His coming ! Then the text says the day of His wrath is come. This greatly infers that the seventh seal (see timeline), has a profound rapture harvest significance with the 144,000 mission to destroy them. All of this in perfect sequence, that Jesus returns with ten thousands of His angels, and sends them forth to gather all that offend, the tares. Ignoring the man made edited chapter break; And when He opened the seventh seal there was silence in Heaven for half an hour. The events that transpire must be so dramatic and or horrific, that even the four beasts and the twenty-four elders stop praising God. This is unprecedented and shocking since they always praise night and day without ceasing. All of Heaven is speechless, watching all of humanity being slaughtered. This slaughter is described in detail in Isaiah, Nahum and Joel. It perfectly states in stunning sequence, that after the sun and moon are darkened (6th seal), that there would be a strong mighty people that would go forth with fire blazing before them. The land is as the garden of Eden before them, a desolate wilderness after them and nothing would escape. As horsemen, they shall loudly and speedily burn the stubble (tares) causing much pain and death. They are set in battle array, with military precision they take the land. These are not humans, but the LORD God's sealed reaping angelic army. This is shown in their inability to be wounded or die (144,000 glorified bodies) and having superhuman strength. Climbing (not walking) on walls, leaping on mountain tops and housetops. As our Groom stated, He would come as a "Thief In The Night" leaping, so be it with these battle angels. These reapers enter in through the windows as a "Thief" also. The earth quakes before them and they are doing this in the darkened sun and moon. This will be the most horrific killing spree anyone could imagine. God's reaping angels removing the tares (all that offend) from the kingdom, in total darkness, with flames behind them, entering each house of the wicked. These 144,000 kings will then gather their blood drained bodies in bundles; place them on a bed of 2/3rds remaining trees and burn them on the prepared altar of the drained Euphrates. This is literally Psalm 91 being fulfilled; a thousand shall fall at thy side and ten thousand on thy right, beloved we will behold the reward of the wicked. These 144,000 are not unlike when the LORD first darkened the earth for three days and then went forth to kill all the firstborn in Egypt at Passover (the last plague back then also). There is another Passover plague coming, all the firstborn will be killed again; yet the second born (or born again), will be granted a reprieve from these death angels. Therefore, those who pray the prayer of salvation and paint the doorway of their heart with the blood of the Lamb, will be passed over by this terror, that silenced all of Heaven. My people go into thy chambers and shut thy doors and hide thyself for a little while, until the indignation pass (2nd Passover). The next verse in Joel says, after this destruction of His great army, the LORD will utter His voice!!! Beloved, this is the mystery of all the prophets fulfilled. The dead in Christ from creation to this day will rise and we which remain shall meet Him in the air at the last trumpet, after the sinners are removed from the just. Worship Him that sits on the throne ! Each of the 12 tribes of Israel has distinct attributes. Genesis concludes with Jacob telling his sons to gather around, to learn of the Last Days and assigns each of his 12 sons an attribute. Ruben = might, strength, dignity & power. Simeon & Levi = instruments of cruelty of violence. Judah = shall be praised, a lion, you are gone up, who shall rouse him? You will gather the people, binds himself to the Vine. He washes his clothes in the blood of the grapes. Eyes are red with wine and teeth are white with milk. Issachar = strong shoulder and a servant. Joseph = fruitful, hated, blessed in many things above his brethren, including the womb (Mary parallel, with womb and her husband's name). If this does not portray the Lord of lords perfectly, I do not know what would. Thus it is very easy to see why Jesus would want these like-minded, innocent souls to follow Him everywhere. These are the lineage of the "excellency of Jacob" and His sinless "worthies". The 144,000 are not evangelists, but angelic warriors arrayed for destruction. They will return before Jesus, to destroy with the authoritative seal of God, reaping the earth of ungodly tares. In the name of He who is the first and the last, to God be the glory, for ever and ever.